۞ Book A Morocco Tour Now! Berber Treasures Morocco tours immerse you in exotic, unique and unforgettable Morocco exploring the fascinating history, landscape and culture of Morocco. 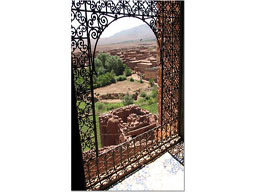 ۞ Small Group Tours: join one of our Berber Treasures Morocco group tours - small groups only! We also custom design bespoke private Morocco tours - choose a tailor-made Morocco travel itinerary designed and personalised especially for you. E-mail or Call us now for details or to plan and book your Morocco tour. Arrive at Marrakech Airport and transfer to your hotel or riad. Afternoon guided city tour of Marrakech including the UNESCO designated world heritage old medina, La Bahia Palace, el Badi Palace, Koutoubia Mosque and Djemaa el Fna Square. Overnight n Marrakech. 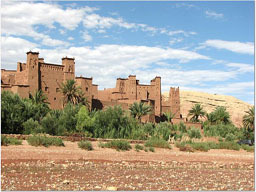 This morning you depart Marrakech for the UNESCO desiganted world heritage village of Ait Benhaddou. Travelling by 4-wheel drive from Marrakech via the Tizi n’Tichka mountain pass (2260m) as far as Telouet, you visit Glaoui Kasbah before setting off on your adventure bicycle tour of Morocco. From Telouet you take to your mountain bicycles, fully supported by your Berber Treasures driver and vehicle. Cycling through scenically situated small Berber villages and the Ounila Valley you make your way to the stunning kasbah village of Ait Benhaddou. Overnight in Ait Benhaddou. Leaving Ait Benhaddou via the beautiful Taslmante Valley and Boutaghrar you visit an ancient troglodyte settlement and may see nomadic Berbers living in caves handed down through generations of families. It may be possible to visit one of these Berber familes, share a refreshing cup of mint tea and learn about their unique lifestyle. The final leg of today’s Moroccan cycling adventure takes you to the interesting Dades Gorge. Overnight in Dades Gorge. Today you cycle to the Berber oasis town of N’kob. 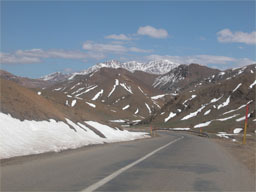 Setting out your route takes you through the Dades Valley which lies between the High Atlas Mountains and Jbel Saghro Mountains (Jebel Sarhro). Making your way into the Jbel Saghro Mountains you cross the Tizi n’Tzazert pass (2200m) all the while enjoying stunning panoramic views in every direction. 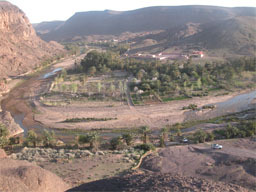 Continue onto the Berber oasis town of N’kob which lies at the foot of the Jbel Saghro Mountains. Overnight in Nkob. Continuing your mountain bike exploration of the Moroccan desert you ride to the beautiful seemingly endless date palm groves of the lovely D’raa Valley – the largest date palm groves in Morocco. The mountain cycling portion of your Morocco tours over, you take to your automobile re–cross the High Atlas Mountains and return to Marrakech. Overnight Marrakech. Morning transfer to Marrakech Airport where your Morocco bicycle tour draws to an end. Tour Ends.